The timeless painterly quality comes to like in a pattern that calls to mind an animal print. Originally painted by Madcap Cottage designer John Loecke, Mill Reef is one of our favorite patterns. The timeless painterly quality comes to like in a pattern that calls to mind an animal print. Originally painted by Madcap Cottage designer John Loecke, Mill Reef is one of our favorite patterns. Under the Madcap Cottage for PORT 68 collection, the Mill Reef lamp is a designer classic. 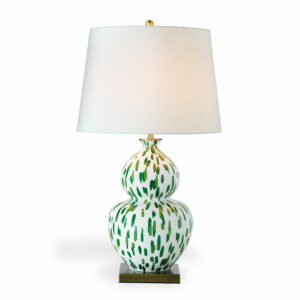 Scaled in the double gourd shape, this porcelain lamp works well next to the sofa, end table or buffet. Available in indigo and green with white accents. The lamp will ship with our classic off white hardback shade (as shown), but the Madcap gents suggest mixing it up with one of their patterned shades from their collection. We have also shown the lamp with Cove End Oyster hardback shade. SHAS-363-03. It measures 17″ x 18″ x 13″. 3 way switch. 100 watt max bulb. Aged brass finished metal hardware. Metal ball finial. Shade: Off White polyester Round Hardback Shade. Soft rolled edge trim. 14″ x 17″ x 12″SH. Brass spider.